Last view: 1157 days Infidelity: I hope you saw my message about the flippers glitch. Here it is in action - skip to 1:26:35 - you can't dive, and when you go into the menu, the game bugs out. Last view: 12 days Thank you for posting! A very big glitch that one. Thankfully its all set now. I'm still working on other things before I release another update. 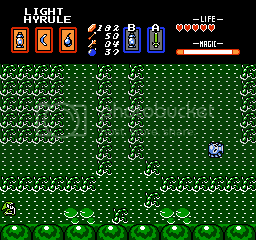 This glitch was infact caused by new asm for the sprite boxes. 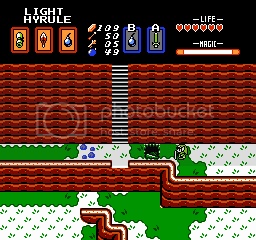 Ok, so I was able to figure out that the issue is not the screen on which you play the ocarina, but simply playing the ocarina while on a staircase will cause the game to freeze. 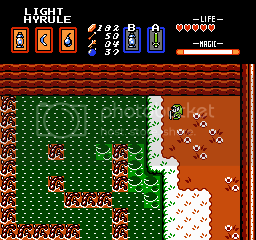 Another issue I encounter was that dungeons 7 and 8 were extremely glitchy and they would cause me to lose the ability to swing my sword and I could not progress to the end in either dungeon. Gonna update to 1.5 and will report back. Last view: 12 days Thank you for the report! Yes please update to v1.5b, because people have been reporting that they can get through all the dungeons. One report was that my new inventory selection is not working during the final battle, and an issue with exiting the inventory back to the main final battle. But I will definitely check the ocarina when link is on stairs. edit confirmed on my latest version. I had a specific check for tile 50 which is the stair tile, and if it was equal, to just rts, but the rts would cause an infinite loop, freezing the game. I think this was something I left in way back in the infancy of the ocarina, cause I had a lot of bizzare issues when doing that asm. But there is no more freezing on the stairs when using the ocarina! Thanks again for that very detailed check! Stuff like that really helps narrow down my searches! Last view: 1460 days This is on v1.5b. I have several minor bits and one glitch/bug. in several places there seem to be tiles that are the wrong color. I was in the first dungeon trying to figure out how to get to that last room on the far left. Somehow I got stuck behind the background layer. Now since I only have the blue lantern I have a tendency to go into rooms, press B to light the room and then hold A to hold the sword out which makes the room stay lit. Anyway I don't remember exactly what I was doing in this particular room with the lamp & bombs, but this time I ended up stuck behind the floor tiles and able to leave the room. Last view: 12 days Wow thank you for all of that! 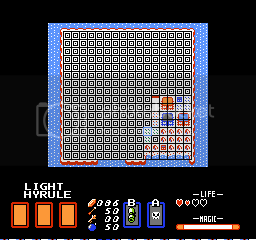 the dungeon glitch I'll try to figure out/recreate. Last view: 1460 days I'm glad to be of help. I just figured this whole mess out. OK. So equip the Lamp, hold B to use it, then while still holding B hold A to brandish the sword. This keeps the lights on. Then while still holding A, press Select to switch to the Bombs. 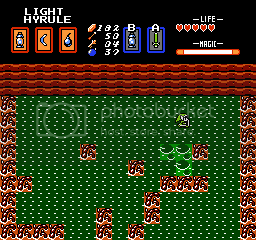 Let go of A and the lights stay on and you can freely use the Sword and the bombs. If you press Select to switch back to the Lamp the lights will go out and there are no issues. 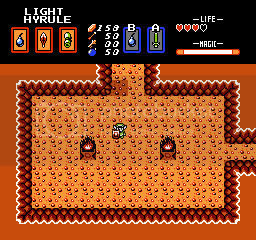 However, if you try to leave the room while the lights are on and you can freely use the Bombs and Sword it will put you below the background for the room transition but it won't let you leave causing you to get stuck. But I just noticed that if you then switch back to the Lamp you will then be able to leave the room so at least this isn't game breaking. I'm guessing the issue is that the code for the Lamp isn't checking for the B button being released specifically or whether the lamp is even currently equipped? I have a couple of suggestions that I think would make the game a bit better. 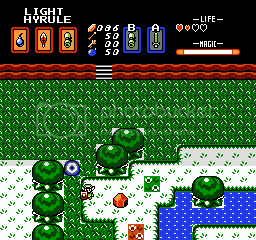 First, I think it would be more aesthetically pleasing and more consistent with the rest of the Zelda games if the 1 rupee gem was green and the 5 rupee gem was blue. It should be a simple change to make to each of the two objects. The other thing that kinda bugs me is the swamp area outside Dungeon 2. Also, going back to the issue of there only being a maximum of 255 rupees. Perhaps it might be a good idea to reduce the frequency of item drops in general. 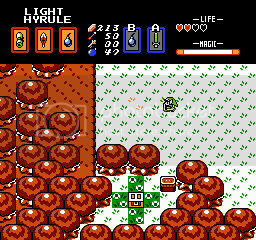 I find that I very quickly max out my rupees as well as my supply of bombs and arrows. So a good balance for the game might be to make it so that the item drop rate from bushes should be cut by 50%. 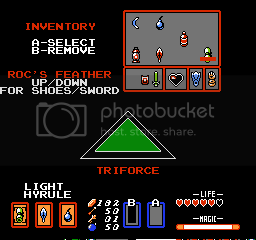 And that hearts and rupees be the most common dropped item with arrows and bombs being much more rare. 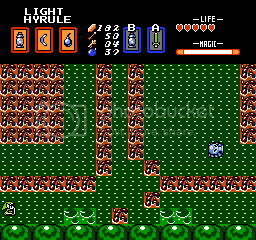 Along with this having bunches of 10 arrows and 10 bombs be available to buy in the game's rather plentiful shops. I just noticed that the bombs give me 4 for each pick up. That seems like a lot and is contributing to the feeling of over abundance. And just having beaten Manhandla in two hits, I'm thinking it might be a good idea to make the bosses more durable. Obviously that entrance isn't supposed to be there. At which point all seems normal. Last view: 1530 days I'll echo the item drop frequency. I think it's way too easy to max out too, which makes the item shops redundant once you've picked them clean on the unique stuff such as maps, hammers, etc. I'm not big on grinding in games, but I feel that the threshold could be a little higher right at the beginning. There are so many "It's a secret, don't tell anyody" caves too right around the starting area. 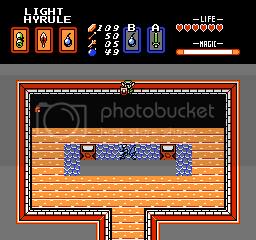 Within five minutes I've usually maxed out on rupees and can buy everything that is for sale. Maybe this is intentional, but I feel that I should have been forced to work a little harder for the lantern and the map. Have to disagree with Vanya about the swamp though! I really like the way those red tiles contrast against the green swamp water. There's way too much green on that mockup screen. True, the contrast is nice but the blockiness of it is unappealing and clashes with the much smoother look of most everything else. Also, living in South Florida, I can tell you from experience that the endless expanse of green is much more realistic to an actual swamp and I feel it makes it slightly more difficult to navigate which is also more true to a swamp. And if anything I'd even suggest reworking the layout to make more of a maze. Last view: 1705 days I'll second Vanya regarding the swamp. The color change makes the squared tiles stick out too much. I can live with the swamp as it is - but I rather have a more 'non-tiled' look. Last view: 45 days Since you mention the swamp, I have my own personal problem with the forrest. It is like it is autumn. I prefer it within the woods that way. Last view: 12 days @Vanya: That random staircase you uploaded, can you recreate that? If so, do it, then do this. The flippers /air guage/inventory are all resolved. 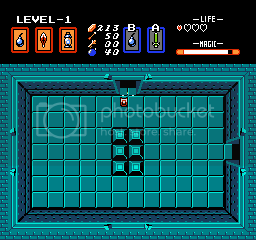 I'm currently working on the blue lanten glitch in dungeons. The Ocarina issue on stairs has been fixed as well. 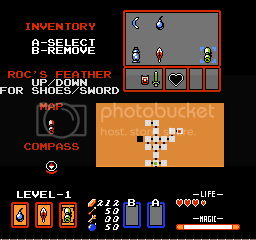 Also which was broken for some reason, the hook shot can how latch to and retract dungeon items like keys, secret item, map, compass, heart container, triforce piece. I'm considering the swap design report. The forest, I'm not sure Thanatos. Vanya stuck with my original green palette, and what he suggests is possible. What you did, is alter the palette, and I can't have that, but I'll figure something out. Last view: 1530 days Stop telling him to greenify the game! I love the autumn colored woods. The use of that reddish/brown/red currant nuance is one of the most aesthetically appeasing things about the hack in my opinion. I love the looks of the caves, the woods and the swamp. It brings so much color and atmosphere to environments that are usually a little boring and washed out in Zelda games. Last view: 12 days Exactly, I don't want a whole screen using one palette. What Vanya proposed actually works and he even demonstrated how the swamp pads color structures currently are incorrect. That and the seweedy looking things were recolored as well, and the more I look at the swamp he submitted, the more I'm thinking of updating it. buy I don't want people to start uploading what they want to be seen. The swamp however, I can understand how the looks of it are unappealing, so I'm more prone to tweak that area. obviously I used LA as a template for the world. But I'm using a world that has about 8 independent palettes, and I'm trying to present it with only 4.
this was never meant to be a massive project, but it evolved into such, and I just never planned/prepare for such a task, and the palettes unfortunately are limited. 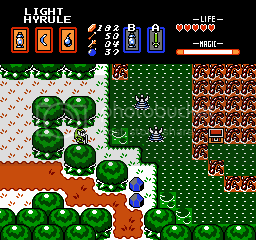 I would've had to do what lttp does, fade in and out of different areas to present new palettes, but I've only done that for chr swapping. All 256 screen ids can load up a chr bank, if you watch the ppu viewer in fceux while playing, you will see the method up my madness. I've played Link's Awakening, cheers. This is not Link's Awakening. 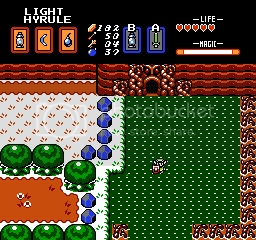 This is The Legend of Link. I think the autumn trees are beautiful. Why do they have to look the same as they did in LA? Last view: 672 days Honestly ? 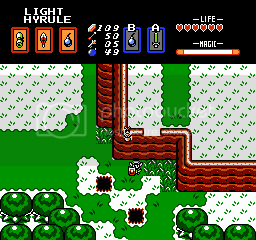 go play both versionf of links awakening again. Look at infilds whole ow map, even though its mirrored in reverse. The minor palette change would help, trust me on that. If infildelt knows something more about of a palette issue with zelda 1. I can understand why he did that but if it can be adjusted lil bit more without screwing up the whole hack GREAT! 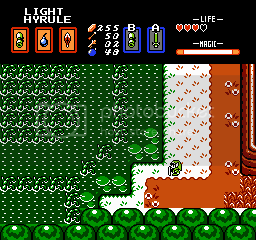 Last view: 45 days After looking at the palette used in LA, I used the NES palette to imitate it. It is not quite, what I have been looking for, but it will serve its purpose. Last view: 1705 days I think the autumn colors are nice and should NOT be changed. Last view: 1693 days 1.5 works much better! Got through the whole game, but haven't found the last two items in final dark world dungeon so can't kill gannon yet. One issue I noticed is that with hookshot or longshot, I'm not able to grab that over world chest near level 3. Both items will only go to the edge of the first platform and don't cross over. Does that one require a different item? Another issue I noticed is that you are able to walk off bridges in the top part of the over world map by walking down. You then can walk on air. I have not seen this to be useful for anything as it has led to a dead end everywhere I tried it. Some stuff seems very well hidden—I have not found the prescription to buy medicine or the book the bored guy wants. The hunt is fun, but I feel I have looked everywhere. Not complaining, just a compliment for not making the game too easy! MySQL - queries: 121, rows: 161/0, time: 0.076 seconds.